Can a cruise ship passenger make a difference instead of just an impact? 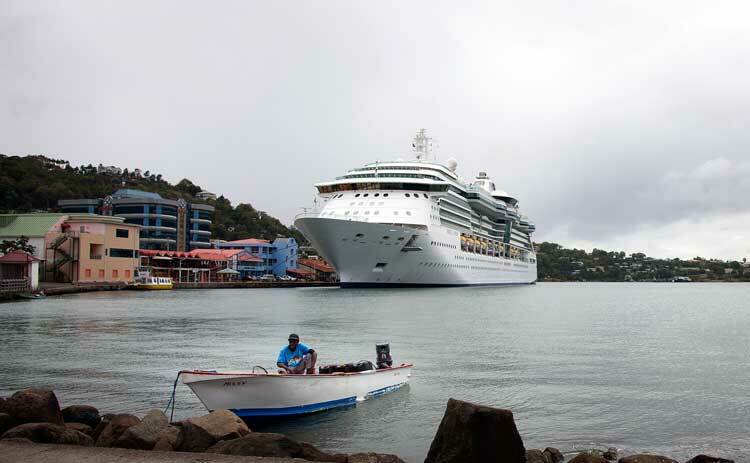 Our family travels frequently, and sometimes our travels take us on a cruise as one of the easiest ways to visit islands. But I’ve always struggled with the idea that some of the larger cruise ships we’ve sailed on might be making a greater negative impact than positive one. On our land trips, we’ve made efforts to visit local villages to learn about the efforts of NGOs to improve the environment and lives of local people, or we stay in lodgings owned by indigenous people. But I’ve always wondered, as a passenger on a mass-market cruise line, with thousands of people visiting a destination for just a few hours, could my family have a positive impact? Could we tread lightly, support the local culture and leave the place better than we found it? Thanks to Pack for a Purpose, we found we could! In April we cruised on Adventure of the Seas. We were cruising to celebrate our daughter’s birthday and graduation. It felt right to celebrate this good fortune by helping people on one of the islands we visited. 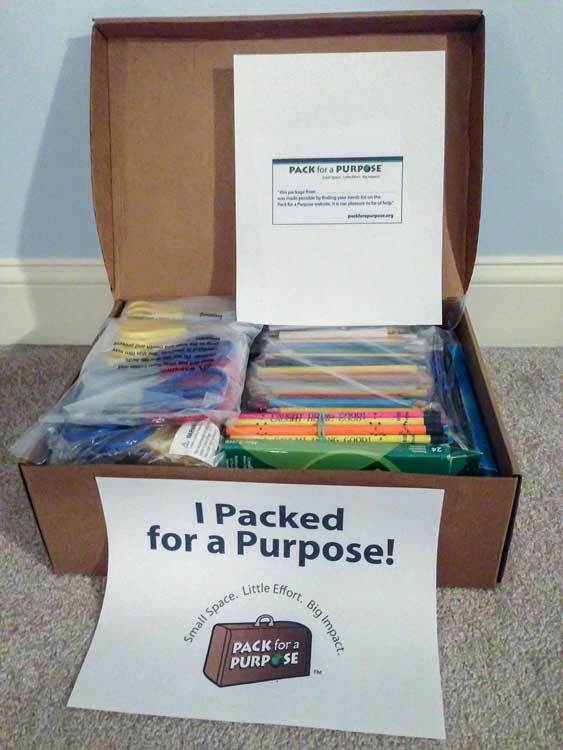 After learning about Pack for a Purpose from articles in my newspaper, I investigated the website. 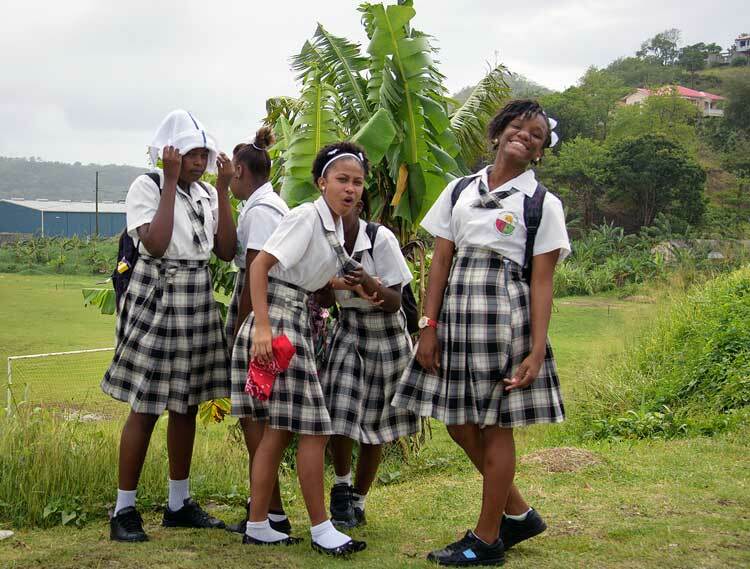 I was delighted to find several organizations located on islands on our itinerary had submitted wish lists to PfaP through the Sandals Foundation, PfaP’s partner on many Caribbean islands. About two months before our trip, we posted our intentions on social media. We shared the wish list, explained our plan and the mission of PfaP, and donations started rolling in. We ended up with a good sized backpack full of pens, pencils, crayons, pencil sharpeners, erasers, flash cards, and scissors for the preschools in St. Lucia. It was sometimes difficult to help donors see past their own image of these islands as places for the wealthy—they imagined a place full of millionaires in villas! But part of my research about the islands taught me that getting supplies onto the island is very expensive and that despite the fancy resorts, there are very few other employment opportunities available, and tourism is often the largest industry on the island. 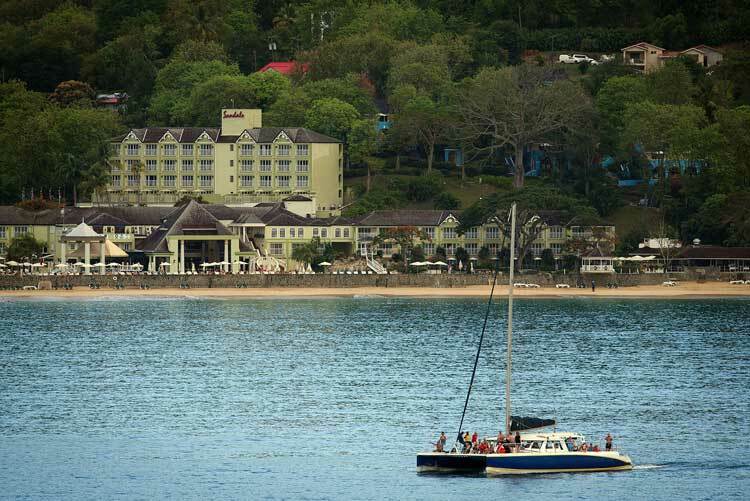 We had booked private guides in advance for our visits to St. Lucia and Antigua, so we arranged to make a stop at Sandals La Toc in St. Lucia with our guide after a full day exploring the beautiful island. The Sandals Foundation requests items are dropped at their front desks and they will organize fair distribution with few disruptions to the education of the children in the programs. As a preschool teacher myself, I knew firsthand how visitors in the class can be very disruptive, and so I appreciated the concern for the children and the targeted needs lists. When we arrived at the guard gate, he was unsure what we were up to, and I’ll admit, although we were in the nice car of our guide, we were looking a bit disheveled after a hike on the Tet Paul Nature Trail! Luckily, the front desk knew about our purpose, and the guard waved us in. We were greeted by a Sandals executive who thanked us for our donation and promised to make sure it ended up at its intended location. We found it very simple to drop our donation and return to our cruise ship. It almost seemed too easy to make an impact, and I wondered if our donation wouldn’t just end up on a shelf somewhere. But soon we were arriving in Antigua (another PfaP destination with the Sandals Foundation Partnership). We had another private guide for the day. Keisha was an enthusiastic ambassador for her island, and she and her husband were working hard to make a great life for their three children. 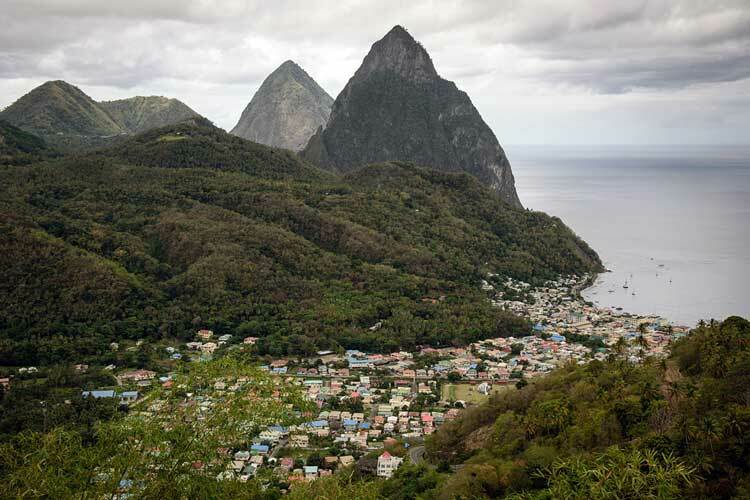 During the course of our day we mentioned that we had Packed for a Purpose while visiting St. Lucia. She immediately brightened up, and told us her daughter attends one of the preschools in Antigua that regularly benefits from Sandals Foundation and by extension Pack for a Purpose. 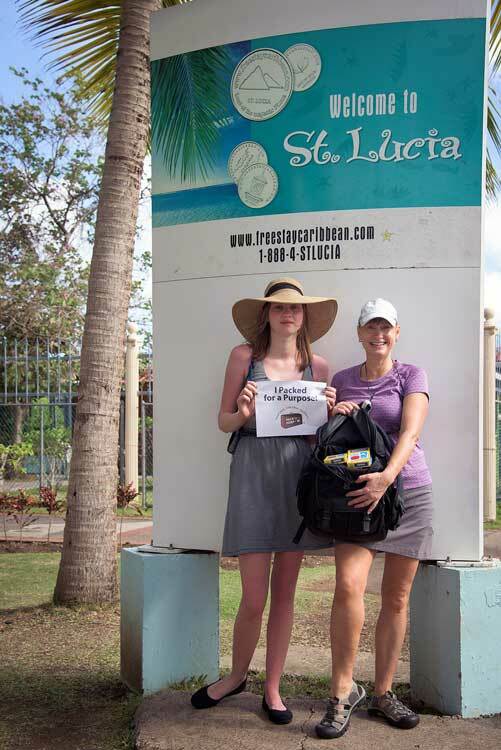 She said her daughter’s school received regular donations of items and special events run by the Sandals Foundation. We were so thrilled to learn that our donation has a direct impact on people of the islands and that they are well aware of these small acts of travelers like ourselves! One of the reasons we travel is to learn more about the people and culture of the places we visit. We endeavor to have a positive impact both during our visit and by educating others about what we’ve learned about a place when we return. I’ve always struggled with our ability to do that as passengers on a large cruise ship, so it makes me very happy to report that we can, even when only visiting for a day! This was our first time Packing for a Purpose, but it will not be our last!